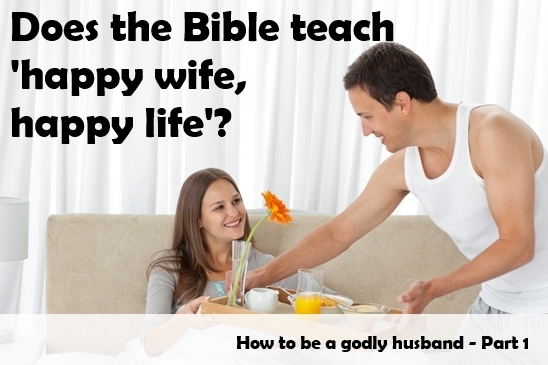 Does the Bible teach “happy wife happy life”? Husbands or engaged men – you may have heard the phrase “happy wife –happy life”. There are signs and plaques sold all over America, often bought for men to follow this advice as they enter marriage. Many churches have incorporated this idea into their marriage courses and counseling programs. What does it mean to make your wife happy? The first truth must understand is that you can’t “make your wife happy”. You can’t “make” anyone happy. People (including you), choose whether they will be happy or not. Some people choose to be happy in what most of us would consider the worst of conditions, while others are never able to be happy, no matter how much money or power or pleasures that may come their way. 07 Jul	This entry was published on July 7, 2015 at 11:50 pm and is filed under Uncategorized. Bookmark the permalink. Follow any comments here with the RSS feed for this post. Newer: Queenly Reign has to become my favorite blog!